Arrive at Maun Airport, where you will clear customs and immigration and collect your luggage. You will be met in the Arrivals Hall by our representative, who will accompany you to the light aircraft for your 30 minute flight into Khwai airstrip, across the Okavango Delta. Khwai Tented Camp is perfect for small private groups, families or independent travellers with its capacity of 13 beds. Combining luxury with the rustic wilderness setting, Khwai Tented Camp allows for the best wildlife experiences set in a community based wildlife resource area. The camp has an air of romance reflected through the elegant furnishings of colonial and tribal eras, and yet provides modern comfort and full service. It lies on the banks of a lagoon on the Khwai River and offers accommodation in Hemingway style tents, built on wooden deckings, with private en-suite bathrooms. Furniture includes a hanging canvas wardrobe, bedside table, luggage bench and sisal matting. The en-suite bathrooms have a flushing toilet, and open-air bucket showers. Large tin-jugs of hot water are regularly provided to supply the bathrooms and canvas wash basins on the verandah. The tents as well as the bathrooms are insect proof. The Camp's main area includes a library / sitting area, and a bar with dining table. Set on wooden decking overlooking the lagoon, the main lounge and dining living area is fitted with comfortable Morris chairs and interesting antiques, to enjoy the camp fire and the evening starlit sky in full elegance. 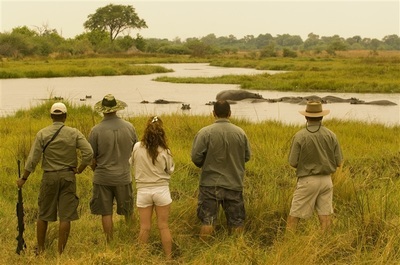 Situated adjacent to the Northern/Eastern part of Moremi Game Reserve and to the Southern/Western corner of Chobe National Park, and along the River Khwai, this beautiful wilderness area provides the perfect setting where a community living in harmony with nature and wildlife is completely evident. The magnificent Khwai River forms a boundary between the reserve and the community area, and is the hub for some of the most outstanding wildlife viewing in the region. As the sole source of water for miles around, the Khwai River attracts wildlife from near and afar. The vegetation here is quite different from the Western section of Moremi where great stands of leadwood and mopane woodlands occur in close proximity to open grasslands and the Khwai River. Wildlife encounters include lion, cheetah, leopard, wild dog, elephant and a multitude of plains game including buffalo, zebra, giraffe and impala to name a few. The Khwai Community Village is home to river Bushmen from the Bayei group, who carry out a naturally harmonious lifestyle. Activities take the form of game drives, guided walks, village visits to the Khwai Community, and day trips to the Moremi Game Reserve. The opportunity to explore the surrounding wilderness on foot allows for guests to enjoy up close and personal encounters with the animals, the flora and fauna. Visitors are encouraged to walk through the village of Khwai, meet some of the elders, and learn how the people live alongside animals in close contact to nature. Overlooking the legendary Chiefs Island and bordering the Moremi Game Reserve, Gunns Camp is one of the last few remaining luxury vintage safari camps, set under leafy palms and African Ebony to blend naturally with its unique surroundings. At the airstrip you will be met by the Camp Managers, and taken to the elevated main lodge area for a welcoming refreshment, and then shown to your en-suite spacious tented accommodation. 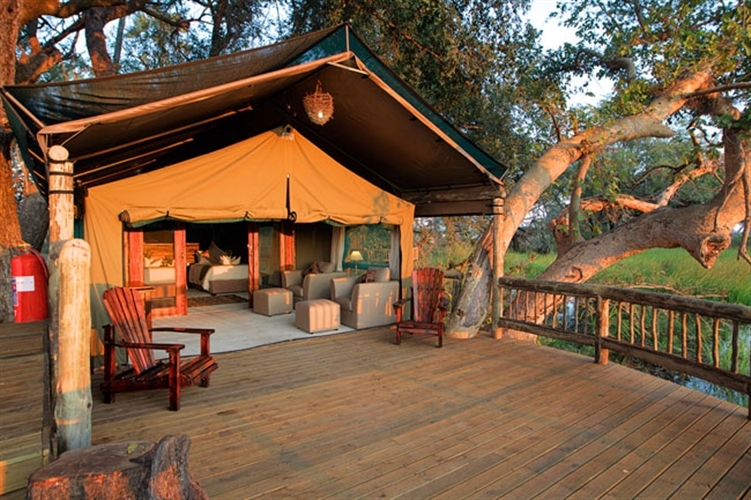 At Gunns Camp there is a fine balance of comfort without isolating one's self from the sights and sounds of nature. 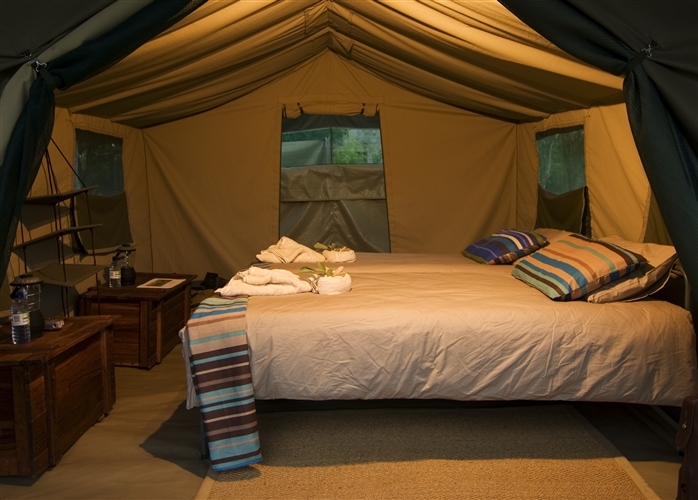 Accommodation at Gunn's Main Camp consists of seven fully furnished, deluxe Kenya-style meru tents with en-suite bathrooms set on raised platforms overlooking the delta plains. The honeymoon suite is built into one of the ancient African Ebony trees and demands unsurpassable views of the meandering waterways. The island is connected to the main camp by a small causeway crossing the wetlands and magically lit by a series of fairy-like lanterns. 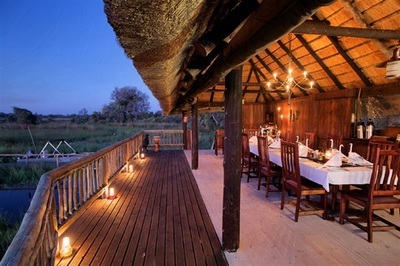 Guests have access to the elevated bar, lounge and dining room, campfire boma and swimming pool. 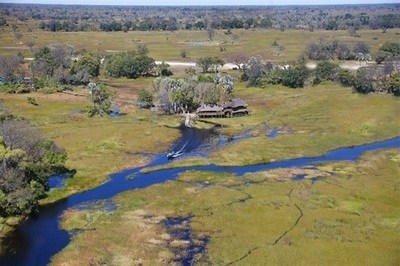 The main activities are mokoro (traditional dugout canoes) powerboat excursions, and guided game walks with experienced guides who have spent their lives accumulating knowledge and understanding of the complex ecosystem of the Okavango Delta. As they show you how to silently observe nature with minimal impact you will begin to realize the privilege and quiet excitement of being in one of those places that makes memories for you. Chiefs Island where your activities take place offers one the of largest populations of African wildlife in the Delta area. 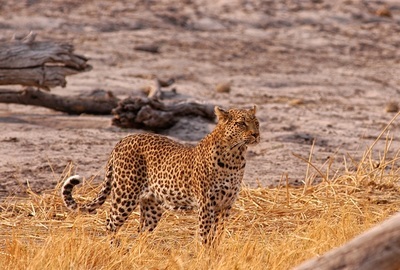 Sightings may include lion, leopard, elephant, buffalo and packs of wild dog running across the plains of the Delta. The concession is also home to hippo , crocodiles , plains zebra and a variety of buck ,including the red lechwe. Gunns Camp is renowned for being a birder's paradise, with over 240 species of bird including the rare Pel's Fishing Owl and the endangered Wattled Crane. In the evenings you can relax in the elevated main lodge, or lie in the swimming pool sipping your drink watching the majesty of the African sunset, whilst reflecting on your day with fellow guests. After an early morning activity and brunch, your pilot will collect you from Gunn's Camp, returning you to Maun Airport (20 minutes), in time for your onward arrangements.